When Do You Pay Taxes on Stocks? 1. How Much Taxes Do You Pay on Sold Stock? 3. How Much in Taxes Do You Pay on Stock Market Earnings? You generally pay taxes on stock gains in value when you sell the stock. If a stock pays dividends, you generally must pay taxes on the dividends as you receive them. If you hold stock, securities or funds in a tax-deferred account like an individual retirement arrangement or 401(k), you'll generally be paying taxes on the stocks when you take money out of the account, not when you sell individual shares within the account. You generally must pay capital gains taxes on the stock sales if the value of the stock has gone up since you've owned it. Capital gains tax on stock you've had for more than a year is generally lower than ordinary income tax. If you've had the stock for less than a year, you simply pay your ordinary income rate. The capital gain is the difference between the stock's sale price, minus any fees you paid to sell it, and the purchase price, to which you add any fees you paid to buy the stock. That value, equal to the purchase price with any fees, is called the cost basis of the stock. Long-term capital gains rates are either 0, 15 percent or 20 percent, depending on your income, and most taxpayers pay 15 percent. If you had a capital loss, meaning the stock decreased in value, you can claim this as a deduction. Generally, you can deduct capital losses from capital gains. You can also deduct up to $3,000 in capital losses from your ordinary income each year. If you had more capital losses than that, you can roll them over to subsequent years until they are used up by the $3,000 rule or deducted from capital gains. It's sometimes worthwhile to sell a money-losing stock or other capital asset to balance out capital gains. If a stock becomes worthless, you can treat it as a capital loss, provided you thoroughly document that fact. Report capital gains and losses on IRS Form 8949. If you sell stock at a loss and buy the same or a substantially identical security within 30 days, that's considered a wash sale. You can't claim a capital loss on a loss sale, although you can add the loss to your cost basis in the new stock. Otherwise, people would be able to sell and repurchase stock that has decreased in value at any time in order to claim a loss. That means you'll ultimately get to save on capital gains or claim a larger capital loss when you finally close your position for good. If you own a stock or mutual fund that pays dividends, which is a payment of cash or stock given to owners of the stock by the issuing company, you often must pay tax on those dividends. Dividends will often be reported to you using IRS Form 1099-DIV. Most dividends are called ordinary dividends by the IRS and are taxed at your usual income tax rate. Some dividends, known as qualified dividends, get special tax treatment. You pay tax on those at your capital gains rate. Usually, that's just 15 percent, though some taxpayers pay 0 percent or 20 percent, depending on overall income. If you're in a dividend reinvestment plan, you must pay tax on the dividend you receive even though you use it to buy more stock. If you get the stock at a discount, the discount itself is taxable dividend income. If you own stock through a tax-deferred retirement plan like an IRA or 401(k), its tax treatment is special. Rather than paying tax on capital gains or dividends as you buy, sell and hold stocks and funds, you pay tax on funds you take out of the account. If you make withdrawals before you turn 59 1/2, special 10 percent tax penalties generally apply. 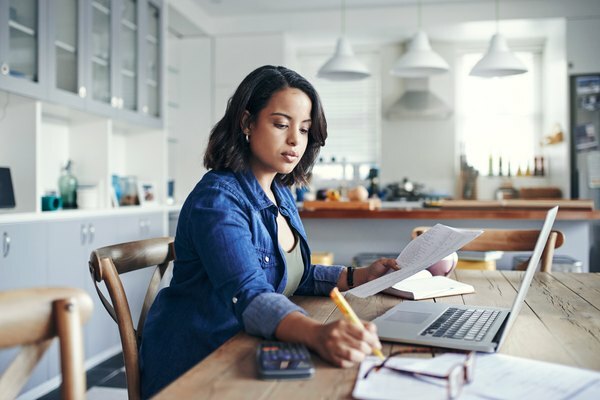 These penalties can be waived if you use the money for an approved purpose, including some medical expenses, health insurance when you're unemployed or higher education expenses for yourself and your family. First-time homebuyers can withdraw up to $10,000 for home-related expenses from an IRA without any tax penalty. Once you reach age 70 1/2, you must begin withdrawing money from the account at a minimum schedule published by the IRS or face a significant tax penalty of 50 percent of the funds you were required to withdraw every year. Certain IRAs and 401(k)s are Roth accounts. With these accounts, you pay tax on the money you put into the account as normal, but you never pay tax on any gains, provided you withdraw the funds after you turn 59 1/2. You can generally convert an IRA to a Roth IRA by paying the deferred tax. Roth accounts can be advantageous if you anticipate large gains or being in a high-income tax bracket at retirement age. Roth IRAs aren't subject to required minimum distributions unless you inherit one. If you inherit stock from someone, special rules apply to calculate the tax basis of the stock. Generally, the tax basis is the value of the stock on the day the previous owner died. In some cases, it may be a date six months later. Either way, this can save families a good deal of money, since the capital gain on the stock can be much lower if the heir sells it rather than the original owner. Some estates may need to pay estate tax on inherited stock, but this only applies to estates that are quite large. Special rules also apply if you inherit an IRA. Generally for an inherited traditional IRA, you must either take minimum distributions within your lifetime or within the first five years after you inherit the account. Withdrawal penalties don't apply, even if you're under 59 1/2. If you inherit an IRA from your spouse, you can treat it as your own under certain circumstances. An S corporation is a special kind of corporation under the tax law, designed for small businesses. It essentially passes its profit and loss on to its shareholders, who report and pay tax on the company's operations through their individual income taxes. The company also files its own income tax return using IRS Form 1120-S. If you are a shareholder in an S corporation, expect to receive documentation every year about the company's profit and loss and your share in it. You can deduct losses up to your basis in the company, a number that's based on your initial investment and increased with each profitable year and decreased with each loss according to IRS rules. Just as you can donate cash or other valuables to charity, you can also donate stock. If you do, you can generally claim the full market value of the stock as a charitable donation. This can save you money over selling the stock and donating the proceeds, since you will not have to pay capital gains tax on the donated stock. You must itemize your deductions, rather than take the standard deduction, to claim charitable donations. Long-term capital gains rates are staying roughly the same from 2017 to 2018, though ordinary income tax is decreasing. This may mean lower tax rates on short-term stock ownership and on withdrawals from tax-deferred accounts. The standard deduction is also increasing, which may mean fewer people will take itemized deductions on donations, including donations of stock. Do You Have to Pay Taxes on Selling Gold? What Happens If You Don't Pay Quarterly Tax Installments on Time? Do I Pay a Capital Gains Tax Only When I Sell Reinvested Dividends? Do Reinvested Earnings Add to Stock Basis? Does Selling Your Shares of Stock Mess Up Your Taxes? What Is the Cost Basis When Selling Stocks Bought With Company Contributions?